Huawei unveiled the current generation flagship models in the P series - the P10 and P10 Plus at the Mobile World Congress (MWC) 2017 show floor in February this year. As we are nearing the end of this year, the company's roadmap for the next year has been leaked. Well, if the Huawei 2018 roadmap leaked by Gadgety via XDA Developers is accurate, then the company will launch three smartphones in the flagship P series. The devices are the Huawei P, P Plus and P Lite in the second quarter of the next year. This is contradictory to the recent reports suggesting that the Huawei P11 will be unveiled at the MWC 2018. That does not mean that the company will not announce any new launch in the first quarter as the Mate 10 Pro and Mate 10 Lite are said to be made available in the global markets during the first few months. Also, the leaked information reveals that new smartphones such as Maya, Honor 1 and Salina will be unveiled. These could be placeholders or codenames and not the actual names of the upcoming Huawei smartphones. A new fitness band with the moniker Huawei A2 is expected to be unveiled in Q1 2018 along with the Huawei 360 Camera, Huawei Scale and Huawei B618 wireless router. Along with these three P series smartphones, another Honor smartphone will be launched in the second quarter. 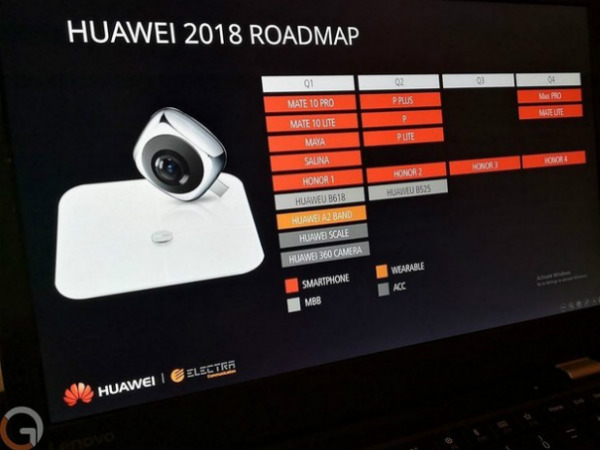 The image of the roadmap also shows Huawei B525, that could be a wireless router. Moving onto the third quarter of the next year, it looks like the company has decided to keep it barren except for the launch of the third Honor smartphone. In Q4 2018, the company is likely to be busy with the launch of the fourth Honor smartphone and the Huawei Mate Pro and Mate Lite for the next year. Though the leaked image of the Huawei 2018 roadmap reveals a lot of details showcasing what the company is planning for the next year, there is no authenticity and we cannot vouch for the same. We need to consider this as a speculation until we get an official confirmation from Honor regarding the upcoming launches and its plans for the next year that is just a few days away from now.